Do not hesitate to writing in my guestbook, I will try to answer and to leave the image him(her) you mas before possibly. the scan is pretty. the quality is good. the bg and text colors doesn't really seem to go with them though. Well, the wallpaper is great. Simple and efficient in portraying a comical every day life activity that we would want to join (or better yet just watch the chefs). But now I am just graving to see the original scan. I'll probably write in your quest book tomorrow or later. Thanks! eri is sooooo cuuuuuuute ! 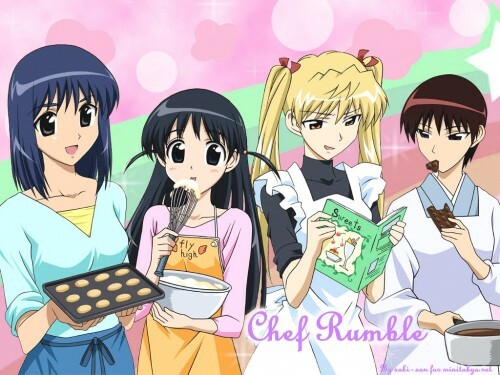 "Chef Rumble" what a concept! anyways I think it adds the drama of the series. mmmmm, those cookies look yummy!